At the recent State FAA Convention held at held at the Mount Washington Hotel, Bretton Woods, NH on April 6-8, 2017, Coe-Brown Northwood Academy FFA’s Much-To-Do Chapter received a number of State Awards and Recognitions. In the category of SAE Recognition (second year members only), Olivia Pittman received a Gold Runner up in Entrepreneurship; Joe Garcia received silver third place in Entrepreneurship; and Madeleine Lounsbury received silver third place in Placement. (In Entrepreneurship the student owns the project. In Placement, the project is in a workplace.) Proficiency Awards went to Faith Wilson, a Gold Runner up in Nursery Landscape Placement for working for her father’s landscaping business and Sydney Wilson who was the State Winner in Agriculture Sales and Service for working at a Farmer’s Market. State Degree Recipients were Preston Bethke, Ryan Graeme and Hunter Tetu. In Career Development Events the team consisting of Faith Wilson, Ryan Graeme, Preston Bethke, Devin Sullivan, Nicole Anthony, Sarah Jensen and Madeleine Lounsbury placed third in Nursery and Landscaping. The team consisting of Joe Garcia, Olivia Pittman, Baily Travers, and Paul Bane received second place in Agriculture Sales and Service with the high individual on the team Joe Garcia in third place. In Forestry, the team consisting of Faith Wilson, Hunter Tetu, Ryan Graeme, Tyler Millette, Dan Gallant and Daydrian Morin took fourth place. In Career Skills- Freshman & Sophomore Level, freshman Colin Gollihur took third place individual. 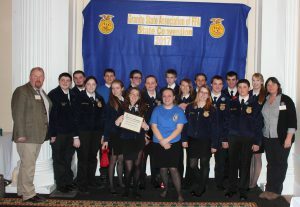 Students who also participated in Career Development Events who did well but did not place included Elizabeth Ward in Animal Welfare, Sarah Jensen in Creed Speaking, and Paul Bane in Chapter Display. Chapter Delegates that were selected are Sarah Jensen and Paul Bane, and Madeleine Lounsbury was selected as a Nominating Committee Member. Congratulations to all the state award winners.